Beautiful 3 tier cake all in white. 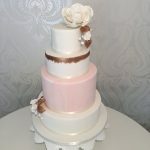 Combination of satin ribbon, lace and strings of pearls finish off each tier. 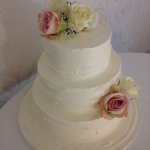 The cake is complimented with sugar roses and jasmine complete with an individual sugar pearl in each flower. 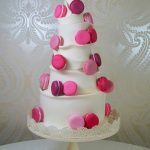 Classic 3 tier standard height wedding cake with 6″,8″ and 10″ tiers that will serve up to 100 portions. 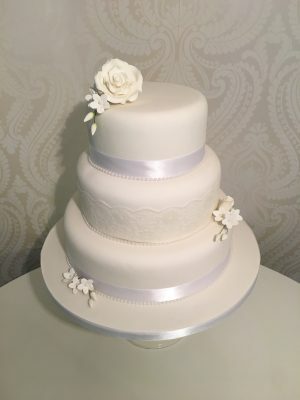 The lace and pearls on this cake are not edible and should be removed along with the satin ribbon. 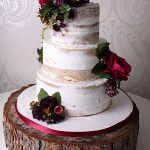 Although made from sugar, the flowers are not intended to be eaten and should also be removed before serving.